Little Leela was worse for wear when she arrived at our shelter. The stray moggie was suffering from an obvious and painful condition in her left eye. Leela’s eye had sunk into the socket and was barely visible – a disorder called micropthalmia. This meant her eye was abnormally small and not able to function normally. In addition, she had a globe rupture – a full-thickness injury to the eye that can arise as complications from other conditions, or as the result of trauma . 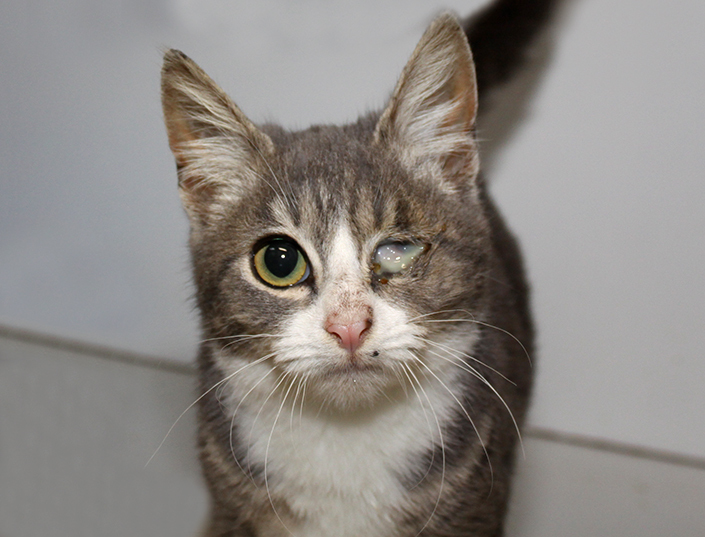 Leela’s conjunctiva – the membrane that covers the front of the eye – was also very swollen and she showed symptoms of cat flu. Despite this, Leela’s spirits were high and all she wanted was to make friends,” said Amanda, cattery coordinator at the Home. 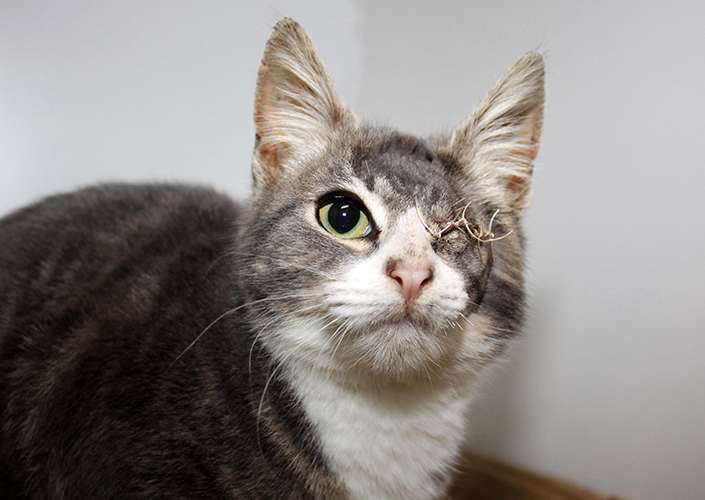 Vets placed Leela on a course of antibiotics to ease her discomfort and fight the infection in her eye. Unfortunately though, the eye couldn’t be saved, so Leela underwent a delicate surgery to have it removed. The brave feline is now ready to find a loving forever home. Leela is gradually coming out of her shell. With a little more confidence building, her sweet nature will shine,” said Amanda. Interested in adopting Leela (ID 1030815)? View her adoption profile or meet her at our North Melbourne shelter. Leela’s surgery and new lease on life were made possible thanks to the support of animal lovers like you. Please donate today to help provide life-changing surgery to other homeless pets, just like her.